With the feast of ultimate deliciousness just a day a way, it’s time to start preparing for the week after, when you’ll be recuperating from all the food splurges and needing some healthy, low Points meal ideas. Well this Ground Turkey Stuffed Acorn Squash is a perfect dinner that tastes as lovely as it looks, and is quite easy to prepare. Seasoned with wonderful autumn flavors, you get juicy ground turkey with the added crunch of celery, tartness of the green apple, and sweet chewiness from the dried cranberries. All of that, stuffed into a tender roasted acorn squash. Comforting and satisfying, this is a wonderful Weight Watchers Recipe to add to your post holiday, “getting back on track” meal plan. Enjoy! 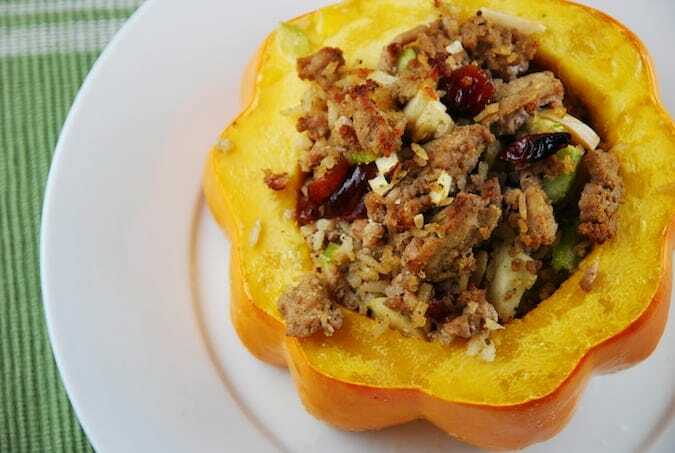 So flavorful, light, and satisfying, the seasoned ground turkey makes the perfect filling for the roasted acorn squash. Surprisingly simple to prepare, the presentation is lovely, and the taste is delectable. Lightly mist acorn squash halves with olive oil and season with salt and pepper. Place on a baking sheet and roast in oven for about 15 minutes….just enough to heat the squash through, then remove from oven and set aside. While the squash is roasting, pray a large skillet with cooking spray or an olive oil mister and set over medium high heat. Add in turkey, and cook until no longer pink. Add in all remaining ingredients and stir to combine. Lower oven temp to 375. Spoon turkey mixture evenly into all 8 acorn squash halves. Place squash into a large baking dish and fill the base with hot water to a depth of about 1/2 inch. Cover with aluminum foil and bake for about 25 minutes. Remove foil, and bake uncovered for about another 20 minutes, or until the squash is very tender and begins to brown. I wanted to like this recipe so badly. It smelled great & had wonderful ingredients but…the filling/stuffing was so dry! I even put a splash of Chicken stock on each one but still so dry. It took a while to cook & the squash was cooked perfectly. There must be some way to make this less dry without adding calories/points. Thanks for the recipe! I will leave the squash in the oven longer in the beginning so that I don’t have to wait another 45 minutes to bake it. It is very healthy and We loved it. Made these over the weekend, to reheat during the week. I thought they were going to be dry, but they weren’t. Reheated in the microwave. I had to add more salt for me, but I loved it. The filling was great and my squash was just right. I made this last night and it was very good !!! Omg. Took a ton of time and shopping, maybe my squash was bad but the worst (!) Meal I have ever made. And expensive . And half my day. And my husband loves my cooking and I am I good cook but hate wasting this time and money. Going to make these tonight…i usually use sausage meat and add pork stuffing mix, will still add the stuffing mix cos it has the flavor. Made these tonight and they turned out great! I think next time, I will use my food processor with the apples, celery and onions for much smaller chunks. Thanks for the great recipe!